Complaining about air travel is its own brand of sport. As it turns out, there are a truly infinite number of things one can bemoan whilst boarding a plane. Babies are crying! Cocktails taste like seasoned cat urine! Your flight attendant doesn't want to flirt with you! But folks who flew with British Airways from Orlando to London's Gatwick airport this past weekend will quickly put all your legroom grumblings to shame: The journey, which should have lasted no more than eight hours, took 77 hours in total. According to a report by the BBC, passengers boarded their plane on Thursday, November 1 as usual, before waiting on the tarmac for a grueling four hours due to "technical repairs." Four hours is enough time for a person to watch an installment of Lord of the Rings and still have time to get started on another one. 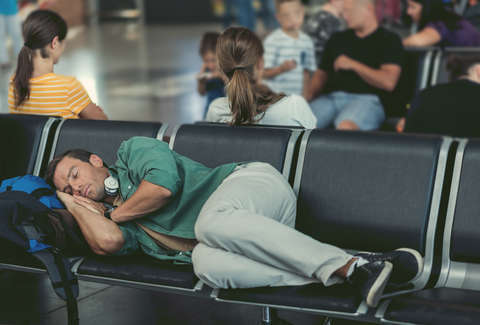 This alone would have been a serious inconvenience, but once officials realized the so-called technical repairs could not be completed, travelers were asked to exit the plane, and spend the night in a nearby hotel. Passenger Sarah Wilson then explained that getting all the passengers into hotel rooms did not go smoothly. "Imagine 200 people turning up in the early hours to check in to a hotel," she told BBC. "It was a chaos and there was not a BA representative in sight taking charge." @British_Airways Been sat on flight BA2036 MCO to LGW for over 2 hours on runway now due to an engineering fault. Clearly known before passengers were boarded. Why on earth load a plane of it is not capable of flying. Been offered one cup of water and a packet of pretzels so far. But wait -- it gets better. The plane's repairs took a full two days, and when Wilson and her fellow passengers finally reboarded the aircraft, the plane made an emergency landing in New York City. Apparently, those technical issues they'd spend the last 48 hours investigating were... still issues. "They had to drop the landing gear, lose fuel to make the plane lighter, and divert to New York," Wilson explained. "It was the roughest one-and-a-half hours on a flight I'd ever experienced... Children were having panic attacks, the turbulence was awful and people were scared, tired, and hungry." Nothing will destroy a trip to Disney World like the absolute trauma of a near-plane crash on the way home. Having landed in New York, passengers were ushered into JFK, where they received no further instruction from the airline. And better yet, it was marathon weekend! Hotels were full! Airbnbs had been booked! So 200 wayward travelers were left to fend for themselves, most of whom had no choice but to sleep on the floor of the terminal. "One mother asked where she could get formula for her seven-month-old baby and the reply was, 'It would be difficult to find anywhere at this hour.' She was in tears," Wilson told BBC. "Children were sleeping on floors in JFK's Terminal 7." Finally, someone did something sort of half-right and got these poor people on a Saturday night flight, landing them in London on Sunday morning. And while British Airways made an apology, there has been no talk of refunds or credits for the folks who literally just LOST 77 HOURS OF THEIR LIVES. No, you cannot put a price on three days of a person's life, but a little compensation couldn't hurt.